There are plenty of reasons to go for a hike after a long, snowy winter. It’s just great to get some fresh air, listen to birdsongs and get out of the house. But the idea of finding naturally shed deer and moose antlers is what really drives me to get into the woods each spring. Over the winter, male moose and deer naturally shed their antlers, and around April, they start growing a new set. Since they don’t need their old antlers anymore, I help myself to their discarded natural works of art. Shed antlers are free for the taking…if you can find them. The search itself is enjoyable. Even if you don’t find anything, you still get a nice walk in the woods. But actually finding an antler is like finding a treasure! There’s certainly an art to finding sheds. As you spend more time shed hunting, you’ll learn how critters move across the landscape. 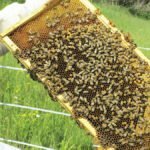 For simplicity’s sake, you need to spend your time in areas where the animals feed and bed. In winter, deer in the North Woods eat what they can get. They love to eat white cedar and red osier dogwood. They will also eat aspen bark, hazel and grass if they can find it. Where available, they’ll eat acorns, crab apples and other mast. Moose feed on a variety of plants as well. They like mountain maple, red osier dogwood, aspen, balsam, hazel, willows and young birch. Surviving our cold, snowy winters is hard for deer, so they bed in areas that provide warmth or shelter. Coniferous forests make good bedding areas because the branches catch the snow and hold if off the ground. As a result, there is less snow on the ground for deer to step through. Plus, evergreens form a thermal canopy, making these forests slightly warmer than the open areas. However, on sunny days, deer sometimes move away from cover. When the sun is shining, they bed on the south face of a hill or the south side of a blowdown to soak up radiant heat, just like a cat sitting in a windowsill. South-facing hillsides are good places to find sheds. These hills don’t have to be mountains—any little rise can be an attractive bedding site. Moose have large bodies that retain heat better than the smaller bodies of whitetails. Cold isn’t such a factor for them. But they’ll still seek shelter for bedding. They often bed inside or along the southern edge of balsam stands. And like deer, look for them to bed along southern hillsides on sunny days. There is ample public land to seek sheds, including state, national and county forest. Get landowner permission before searching for antlers on private property. Now that you have an idea of the places to search, here are a few tips to help you find antlers. Try clear-cuts. Young stands of aspen that pop up a couple years after clear-cutting are great places to find both deer and moose antlers. Check ditch and fence crossings. Any time a deer jumps over an obstacle, such as a ditch, creek or fence, it could knock loose an antler. Look on the south side. Always check the southern exposure of anything that could provide bedding cover, whether it’s a hard forest edge or a single fallen tree. Pay attention to sign. When deer or moose winter in an area, they leave plenty of sign. You’ll find droppings, nipped-off branches, well-worn trails and old beds. Trails and beds may disappear after the snow melts, but you should see other signs of their presence. If you’re not seeing sign, move on. Keep your eyes on the ground. It seems obvious, but new shed hunters frequently look too high—at deer level. Remember, you’re not looking for deer; you’re looking for an antler on the ground. Don’t get frustrated. Even the best shed hunters get skunked. You shouldn’t expect to find an antler every time. Be patient and diligent. Especially when you’re new, it may take days or even years to find an antler. But once you find one, something clicks and the rest become easier. 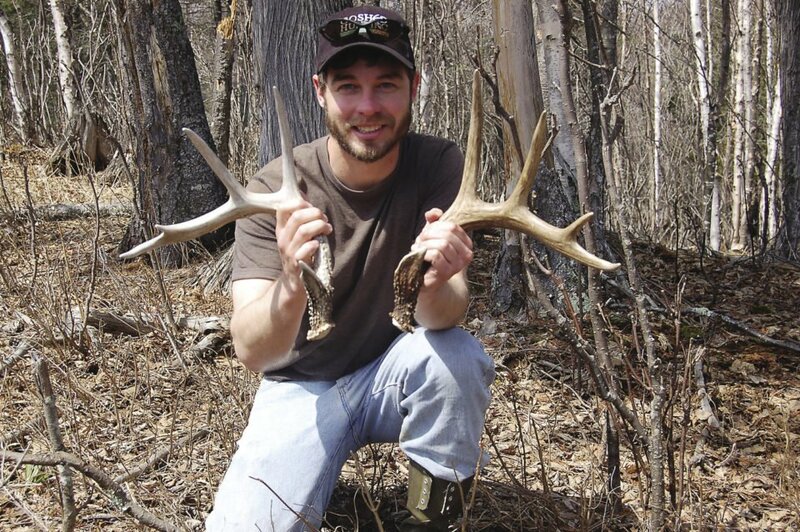 Joe Shead of Two Harbors is the author of Shed Hunting: A Guide to Finding White-Tailed Deer Antlers, available at: www.goshedhunting.com. Joe Shead is happiest playing outside. He began his journalism career in a cubicle, but decided he is claustrophobic. Since then, he has tromped around Alaska, “working” as a rafting guide on the Kenai River. A Wisconsin native, Joe was trapped in Minnesota during road construction and stuck around. 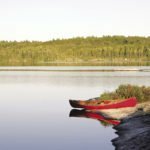 Now living in Two Harbors, he is a freelance outdoor writer and fishing guide. 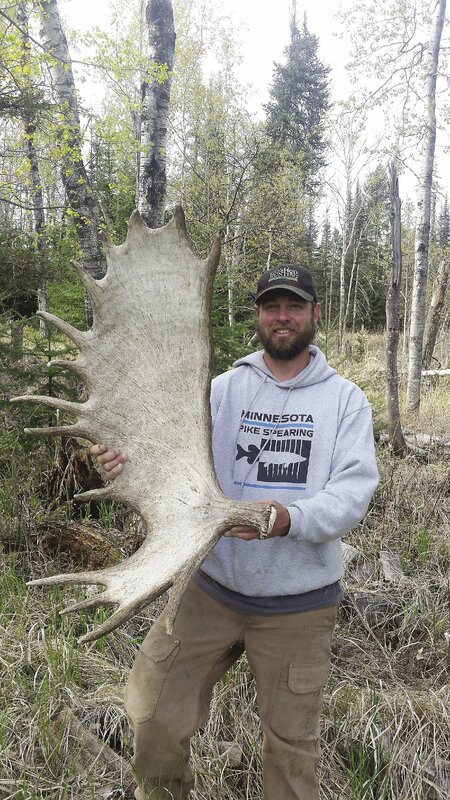 Joe enjoys looking for shed antlers, hunting and dragging lures for long, fishless hours on Lake Superior.